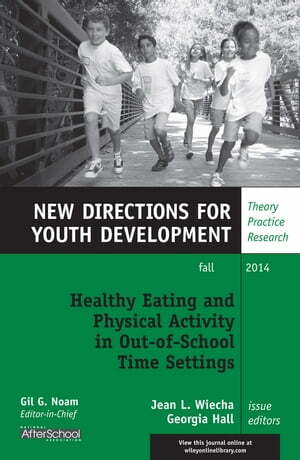 Collins Booksellers - Healthy Eating and Physical Activity in Out-of-School Time Settings by Jean L. Wiecha & Georgia Hall, 9781119045755. Buy this book online. The evidence base of the impact and effectiveness of healthy eating and physical activity interventions in the out-of-school setting is continuing to emerge. By sponsoring this special issue, the National AfterSchool Association provides a platform for the sharing of a range of research studies that can inform and shape current discussion of best policies and practices to support child and youth wellness. The body of work presented in this issue adds considerably to our knowledge of healthy eating and physical activity interventions in out-of-school programs, and highlights the substantial contribution towards childhood obesity prevention that we envision from our field. This is the 143rd volume of New Directions for Youth Development, the Jossey-Bass quarterly report series dedicated to bringing together everyone concerned with helping young people, including scholars, practitioners, and people from different disciplines and professions.